Hillsboro's Rian Porter's last second shot spells victory for the home Sparts. After a second half in which the Hillsboro girls basketball team made just 26 percent of their shots, relinquished a 10 point lead, and missed on consecutive opportunities in the final 18 seconds to win a game against Putnam, the Spartans broke through when post Rian Porter stole an inbounds pass beneath the Kingsmen's basket with 5.5 seconds on the clock, spun around and banked-in a left-handed shot to put Hilhi ahead and ultimately beat Putnam 48-47, Tuesday, Jan. 15, at Hillsboro High School. The steal and subsequent shot came in the wake of Porter missing the front end of a one-and-one with a chance to give her team the lead, and as a result turned what could've been a not-so-happy-ending, into an ecstatic one for the 6-foot junior. "It says a lot that she missed the front end of the one-and-one, then she gets a great steal and makes a tough shot," said Hillsboro head coach Sara Harsin. "It was great for her and us." The game winning basket was the end to what was a pretty impressive night for Porter, who finished with 16 points, 10 rebounds and five steals. Harsin said it was just another example of the junior's steady improvement since the beginning of the season, seemingly moving at an exponential pace over the team's most recent stretch of games. "She keeps getting better and better," Harsin said. "I told her after Scappoose, 'that's the best game I've seen you play. After Wilsonville, 'that's the best game I've seen you play.' And after this game, that's the most poised, best game I've seen her play. She's been great." The coach had a hard time articulating what's behind Porter's recent ascension, but in the end chalked it up to confidence and a growing understanding of the value she brings to the court. "I think it's a confidence thing, but we're also starting to give her the ball in places that are going to make her successful," said the coach. "She's realizing she can dominate down there." 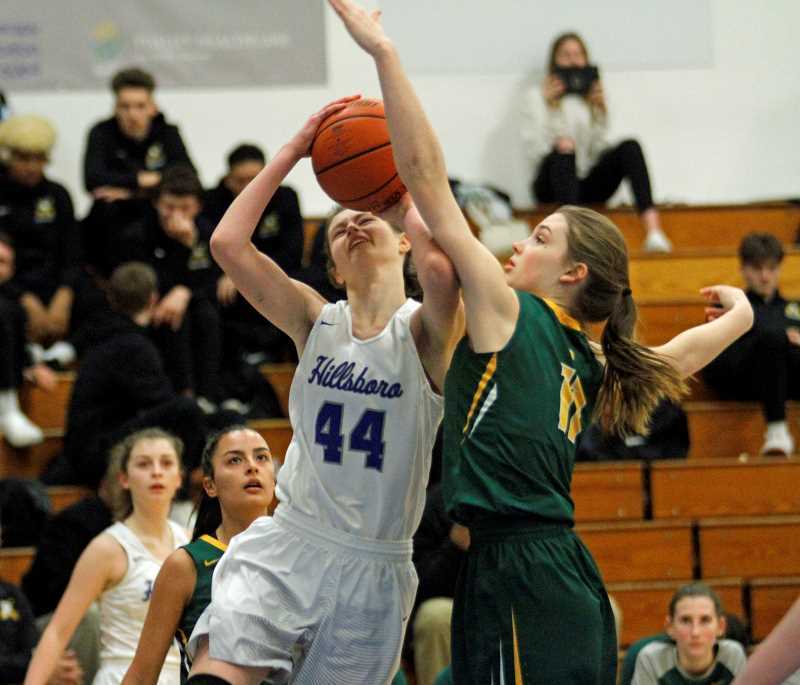 The game was close throughout, with Putnam taking an early lead and Hillsboro closing the gap with timely three-point shooting from junior Kylie Fernstrom and sophomore guard Dylan Kem, who combined to make three three-pointers in the first quarter. The Kingsmen however did their damage inside, getting 10 opening quarter points from Sarah Rope en route to a 16-15 lead after one. Putnam grew the lead to start the second, getting four straight points to take a 20-15 edge. But saw little in the way of production for the remainder of the first half, wilting under the full court Spartan pressure, leading to 22 Kingsmen turnovers on the night. "The pressure was key in that second quarter," Harsin said. "It's nice having McKenzie (Staub) back, allowing us to have another strong guard out there. Abbey (Placher) was also huge for us. I'd swear every time she goes in we get two turnovers." 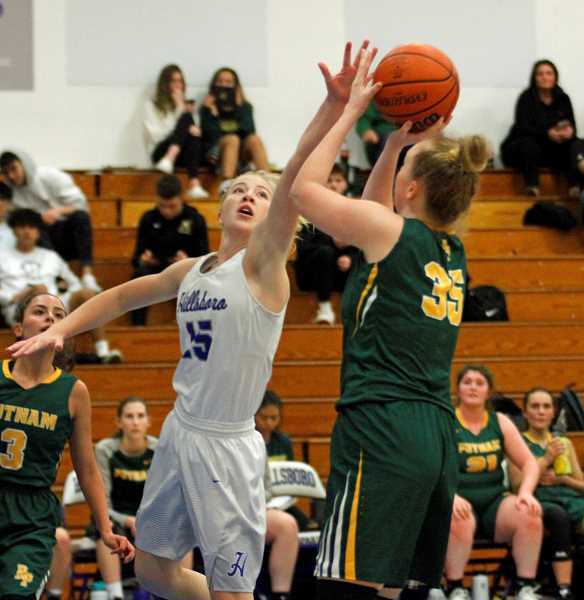 Hillsboro scored 14 of the first half's next 16 points, then opened the second half with a Fernstrom three-pointer to put the Sparts ahead 32-22. At that point the game appeared to be slipping away from the Kingsmen, but five straight points from Putnam's Mimi Booth cut the lead in half, then following a Mya Smith free throw for Hilhi, the Kingsmen scored 11 of the next 16 points to tie the game 38-38 headed to the fourth quarter. Porter was fouled with 18 seconds left and missed the first of two free throws. Then, after a series of fouls, Porter stole a Putnam inbound pass from half-court, tossed to a streaking Kem whose lay-in attempt rattled out. After a Hillsboro timeout, Porter nabbed the Kingsmen's inbound attempt and stole victory from the jaws of defeat, setting off a raucous celebration near the Spartan bench. "It was a statistical anomaly that we won that game," Harsin said. "I told the girls in that last timeout, we're still in this, our defense is going to come through. And it did." In addition to Porter, Fernstrom finished with 15 points and three steals, and Kem added 11 points. Rope led Putnam scorers with 14 points while tallying 17 rebounds.